It has been suggested that a higher calcium intake might favorably modify cardiovascular risk factors. However, findings of an ultimately decreased risk of cardiovascular disease (CVD) are limited. Instead, recent evidence warns that taking calcium supplements might increase myocardial infarction (MI) risk. To prospectively evaluate the associations of dietary calcium intake and calcium supplementation with MI and stroke risk and overall CVD mortality. Data from 23,980 Heidelberg cohort participants of the European Prospective Investigation into Cancer and Nutrition study, aged 35-64 years and free of major CVD events at recruitment, were analysed. Multivariate Cox regression models were used to estimate HRs and 95% CIs. After an average follow-up time of 11 years, 354 MI and 260 stroke cases and 267 CVD deaths were documented. Compared with the lowest quartile, the third quartile of total dietary and dairy calcium intake had a significantly reduced MI risk, with an HR of 0.69 (95% CI 0.50 to 0.94) and 0.68 (95% CI 0.50 to 0.93), respectively. Associations for stroke risk and CVD mortality were overall null. In comparison with non-users of any supplements, users of calcium supplements had a statistically significantly increased MI risk (HR ¼ 1.86;95% CI 1.17 to 2.96), which was more pronounced for calcium supplement only users (HR ¼ 2.39; 95% CI 1.12 to 5.12). Increasing calcium intake from diet might not confer significant cardiovascular benefits, while calcium supplements, which might raise MI risk, should be taken with caution. A May 2012 research study found that taking calcium supplements alone doubled the risk of heart attack. If you have too much calcium and not enough magnesium, your muscles will tend to go into spasm, and this has consequences for your heart in particular. 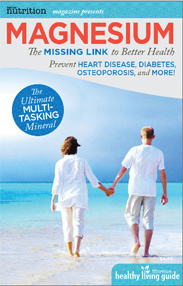 “What happens is, the muscle and nerve function that magnesium is responsible for is diminished. If you don’t have enough magnesium, your muscles go into spasm. Calcium causes muscle to contract. If you had a balance, the muscles would do their thing. They’d relax, contract, and create their activity,” Dr. Carolyn Dean explains. At the cellular level, the magnesium actually opens up the mineral ion channels, allowing a certain amount of calcium to get into the cell, cause a contraction, and then the magnesium actually pushes the calcium out again. If you don’t have enough magnesium to control that activity, calcium actually will build up in a muscle cell and cause sustained contraction, which ends up being a muscle spasm, which, as you say, is like angina or a heart attack.